When your child’s temperature rises, your stress levels may rise as well. A fever is not an illness, but rather a signal from the body that something is not right. Experts say that in healthy kids, fevers usually don’t indicate anything serious. In fact, a fever is a good thing in a way- This spike in body temperature directs the immune system’s white blood cells to attack and eradicate invading bacteria and viruses. It’s a sign that your child’s immune system is doing its job. A fever is defined as having an oral temperature of or above 37.5°C (99.5°F) or a rectal temperature of or above 38.0°C (100.4°F). A lot of Hong Kong parents panic and freak out when their child’s temperature rises, often reaching for the Panadol/ Tylenol at the first confirmation of a fever and rushing to see the doctor. But some researchers suggest that an elevated temperature may help the body fight infections more effectively. So, when should you be concerned? Well, what to do about a fever depends largely on the accompanying symptoms (if any), your child’s age and the temperature reading. 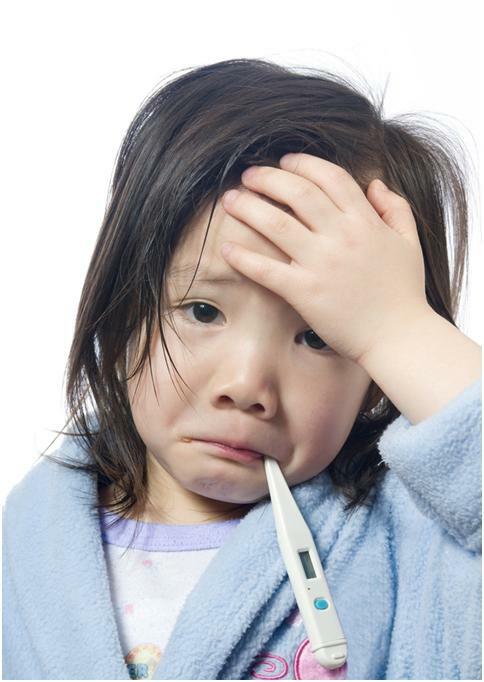 Below are some tips to help you navigate through your child’s fever (and yours as well!). Of course, when in doubt, always call your doctor or paediatrician. 1) For children with a fever below 39.0 °C (102.2°F) and acting their usual self, I generally tell parents to give them plenty of fluids (popsicles and ice chips work as well) and rest in addition to monitoring them. Remember, your goal should be making them feel comfortable, not reducing the fever. Dress them in light clothing and use tepid baths or cool compresses on the forehead to help cool them down. Extra vitamin C and zinc won’t hurt. Give pharmaceutical or natural fever reducers only if they feel uncomfortable. 2) For infants less than 3 months old, a rectal temperature of above 38.0°C warrants a visit to the paediatrician or hospital to receive a full septic workup. An infant cannot tell you how s/he’s feeling and since an infant’s immune system isn’t fully developed, s/he’s more vulnerable to potentially life-threatening infections such as pneumonia or bacterial meningitis. 3) Call or visit your doctor if your child over 6 months and exhibits a fever above 39.0°C with 2 or more of following symptoms: a sore throat, a runny/ stuffy nose, headaches, a cough, body aches, chills, fatigue, vomiting, diarrhea, feeding poorly, unable to drink or retain fluids. 4) Visit your doctor when symptoms include fever with a sore throat, earache or pain on urination. These cases may warrant the use of pharmaceutical or natural antibiotics. 5) If your child is under 2 and the fever lasts over 48 hours or if the fever returns after several days, visit your doctor. 6) Certain symptoms with fever, though rare, require immediate medical attention. If your child is experiencing extreme shortness of breath, has difficulty waking or develops a rash that doesn’t blanch when you touch it or has bruisy-looking purple spots (both symptoms may indicate meningococcemia), go to the hospital E.R. right away. Call 999 or Emergency Medical Services (E.M.S) if you find the lips, tongue and nails turning blue (a sign of not getting enough oxygen) or a stiff neck (a possible sign of meningitis) or severe abdominal pain (a possible sign of appendicitis). 7) A small percentage of children may have seizures with high fever. Though it may be frightening to the parent or caregiver to watch, these febrile seizures usually do not cause brain damage. 8) Remember to keep hydrated with plenty of fluids during the course of a fever and watch out for signs of dehydration. Often times, it’s moderate to severe dehydration caused by the fever that sends the child to the hospital to receive intravenous (I.V.) treatment. If you are pregnant or a new mom, click here to find out how to boost your baby’s immunity! This entry was posted in Babies/ Children, General, Immunity and tagged children, febrile seizure, fever. Bookmark the permalink.